Happy St. Patrick’s Day! The National Retail Federation’s St. Patrick’s Day consumer survey estimates that around 133 million people will celebrate today, with 77 percent of 18 to 24-year-olds participating in festivities and 90 percent of that age group wearing the color green. The NRF also predicts that spending for this year’s holiday will be around $4.8 billion. A day filled with fun activities, celebrations, millions of participants and billions of dollars going into the economy—sounds like a pot o’ gold. And while many will be cheering the “luck of the Irish” this holiday, around 10.5 million of America’s unemployed will be hoping to get lucky—on the job hunt. 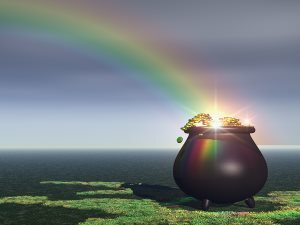 So to help, the folks at Snagajob, America’s largest hourly employment network for job seekers and employers, has come up with five ways to find your pot o’ gold when job hunting. And although this holiday will be filled images of leprechauns, rainbows and four-leaf clovers, Snagajob’s job search advice aims to help you become successful…without luck. 1. Spelling countz – It sounds obvious but employers tell us that spelling and grammatical errors are the number one reason why they would put your application in the reject pile. Don’t be that person! Easy mistakes show potential employers that you aren’t taking your application seriously and worse, may be careless on the job. Take an extra 5-10 minutes and triple check everything. And we mean ev-er-y-thing. 2. Stay appropriate – Believe or not, we see some really bizarre email addresses from job seekers. Something like KissMyIrish@email.com does not make you look professional (at all). Think about creating an email address for your job search that consists of just your name. You’ll be keeping it clear and concise, plus, you’ll have all your job-search emails in one place, (and you’ll know that you won’t scare them away with LazyMoFo@email.com). 3. Do a voicemail audit – Notice any missed calls lately but no voicemail? After your resume, your voicemail may be the next impression an employer will get from you, so make it a good one. Give yourself a call from another number and put yourself in an employer’s shoes to see what they would think of your voicemail. First make sure your voicemail isn’t full – would be a bummer to have someone excited about your resume, but pass you over when they can’t leave you a message. Then, take a look at content: What may be funny to you and your friends could really gross out your potential new boss. 4. Take a look at those selfies – Employers have been pretty honest about the fact that they will look at your social media accounts to get a sense if you will be a good fit for the company. Take down all those tweets about how lazy you are, how much you hate your boss and pictures of the aftereffect from your 21st (or 31st!) birthday. Use the mom rule: If you wouldn’t want your mom seeing it, it needs to be deleted. 5. Follow up, but don’t stalk – You may think that after you send in your application there’s nothing you can do but wait to be called for an interview. Well, you’d be wrong. Give it a few days and follow up with the employer (unless the job posting said no…then don’t….really). Whether it’s in-person, over the phone or through email, it will show them you are taking your search seriously and would be a reliable employee. That being said, don’t overdo it. It would freak them out to see you hiding in the bushes or ‘accidentally’ bumping in to them at the grocery store.